Kuk Sool Won Cork is run by 5th Degree Master/Pyung Kwahn Juhng Nim Matthew Boniwell and his wife, Fiona Boniwell. Matthew is passionate about martial arts in general; Kuk Sool Won in particular. Always studying and practising himself, he considers teaching to be a significant part of his practice and relishes seeing his students grow through Kuk Sool. Matthew first opened Kuk Sool Won Cork in the lovely little village of Ballinspittle. Located on the Wild Atlantic Way and close to the stunning coastal town of Kinsale, it is a unique place with a vibrant community. He has since opened classes in Kinsale and nearby Carrigaline. Matthew has trained continuously, working steadily through the belt system. He has also studied aspects of Kuk Sool not covered in the syllabus that form part of the broader system of this martial art. In order to broaden his knowledge and understanding, Matthew has traveled extensively around the UK and Europe. He has also been to South Korea where he trained with his Korean peers and took part in competition. Matthew has had the great privilege of being taught by the founder of Kuk Sool Won, Grand Master In Hyuk Suh and his sons, Master Sung Jin Suh and Master Alex Suh. Matthew achieved his Masters degree in Kuk Sool Won in 2016 and is also a certified competition judge. Matthew has taught KSW to members of the police force, Parkour athletes and to stunt professionals. He has applied his martial arts skills in films and TV as both an actor and fight choreographer. Beyond his life in Kuk Sool Won, Matthew spent over a decade honing his performance skills as a professional musician in the recording studio and touring the U.K with his band. His music was featured on the BBC’s Top Gear, and in an American documentary on Horror movies. His experience in music and performance is something he applies to his approach to demonstrations in Kuk Sool Won, whether performing or choreographing. In terms of extra-curricular physical challenges, Matt has competed in various events such as Hell and Back and the notorious Tough Guy challenge (the last time he did Tough Guy, he did so with a great time and no injuries, only to trip in the foot bath at the end and gash his shin trying to save his tea and biscuit)! Matthew Boniwell has participated in competitions every year since 1997. He has won numerous trophies and medals. 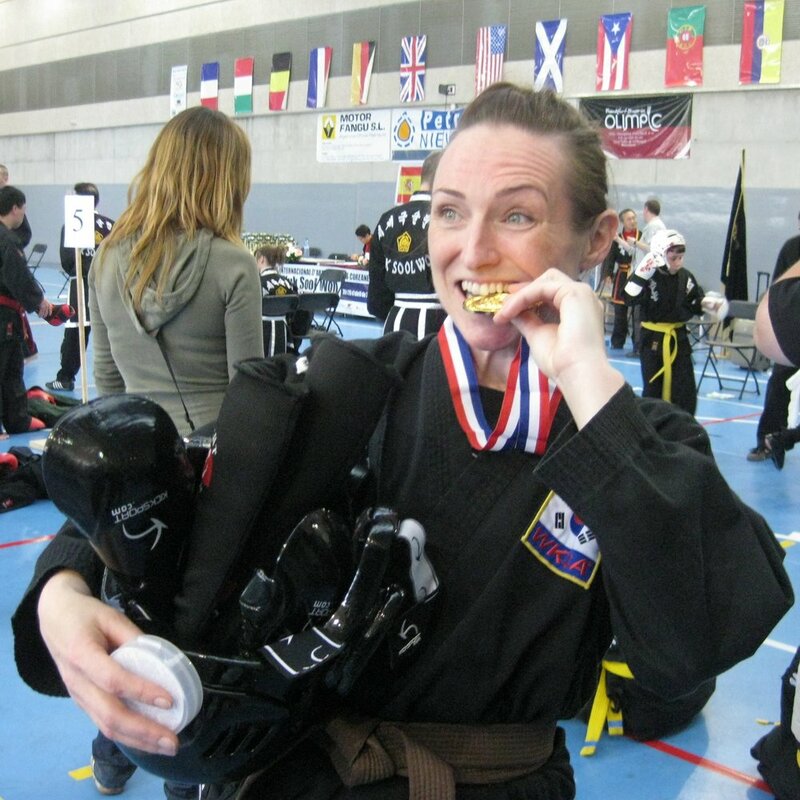 Fiona Boniwell took up Kuk Sool Won in 2010 at the age of 38. She was Kuk Sool Won Cork’s first student. Other than a brief dalliance with Capoeira, she had no prior experience in practicing martial arts and it wasn’t something she ever imagined herself doing. That said, she was hooked after just a few classes. Four years later and after a lot of hard work she became the first Irish Kuk Sool Won Black Belt. Fiona started as someone with very limited flexibility and coordination. With her fifties looming large, she often remarks at how she has never felt stronger, fitter or more flexible. Fiona has taken part in various physical challenges including the London to Brighton bike ride, the Od Head Adventure race and a number of Kayaking events. She has also notched up a sub-4 hour Cork marathon. Continually challenging herself physically, mentally and creatively is something in which she places great importance. Outside the physical arena, Fiona is an accomplished graphic artist. She has contributed to a number of books, comics and exhibitions. She has extensive teaching experience, having worked as an art workshop facilitator for many years, working with all ages from infants to older adults and those with additional needs. She loves teaching. Fiona has been competing every year since she took up Kuk Sool Won in 2010 and has won medals in every tournament she has entered. Try Kuk Sool Won for yourself.